This album contains many high resolution images of ships built by the Scottish shipbuilding firm best known as 'Lithgows Limited'. The River and Firth of Clyde and its tributaries produced over 22,000 ships during the 18th, 19th and 20th Centuries. Although 'Lithgows' was not one of the oldest firms it was amongst the top five in terms of the number of ships it produced. The Lithgow Group grew to become one of the largest shipbuilding and marine engine building concerns in the world for a time with several large subsidiary companies. The firm had its origins back in 1874 when Joseph Russell leased the Bay Yard in Port Glasgow with partners Anderson Rodger and William T Lithgow from the shipbuildng firm of Cunliffe & Dunlop. It is believed that Russell had previously built vessels at Ladyburn, Greenock but no records exist on these ships. In 1879, Russell & Company, as it was then known, purchased the Cartsdyke Mid Yard in Greenock and two years later they acquired the Kingston Shipyard in Port Glasgow from Henry Murray. When the partnership was dissolved in 1891, Russell retired, Rodger took over the Bay Yard and W T Lithgow assumed control of the Kingston and Cartsdyke Yards, the latter being sold to Greenock Dockyard Company in 1900. W T Lithgow's two sons, James and Henry, assumed control and bought the Bay yard in 1911. Four years later Russell's took over the old established Port Glasgow shipbuilder Robert Duncan & Co and its East Yard although the yard continued to trade under Duncan's name until 1931. In 1917 the Lithgow brothers acquired a controlling holding in the well established marine engine-building firm of David Rowan & Company whose substantial works were based at Elliot Street in the Finnieston District of Glasgow. In 1919 Lithgows purchased two neighbouring shipbuiders, namely Dunlop, Bremner & Co and their Inch Shipyard which was just west of Lithgows' Kingston Yard and Wm Hamilton & Company and its Glen Shipyard but, again, both subsidiaries continued to trade under their own names for many years - Dunlop, Bremner continued to trade as a shipbuilder until until 1926 and Hamilton until 1963. In 1920 the firm purchased steel stockholders James Dunlop & Company thus obtaining a secure supply of building materials for their growing shipbuilding empire. In 1923, two significant acquisitions were made. Firstly, Lithgows purchased the closed yard of Murdoch & Murray, thus obtaining control of the great majority of the Port Glasgow water front from Bay in the east to Inch in the west. They also bought the old marine enginebuilding firm of Rankin & Blackmore Ltd and their famous Eagle Foundry in Baker Street, Greenock. Rankin & Blackmore traded as a subsidiary of Lithgows for the following 41 years. In 1928 Lithgows purchased the Irvine based shipbuilder Ayrshire Dockyard Ltd. However, the later 1920s and 1930s brought a dearth of shipbuilding work during the Great Depression and a period of shipyard retrenchment followed. The Inch shipyard was sold to National Shipbuilders Security and 'sterilised' for 40 years in 1933 and the Bay shipyard was closed and demolished in 1935. The rationalisation programme, covering all of UK shipbuilding, was proposed and greatly influenced by Sir James Lithgow. In 1935 Lithgows took control of the huge shipbuilding and engineering concern, the Fairfield Shipbuilding & Engineering Company at Govan, which had its origins in the mid 19th Century and had been previously influenced by such prominent shipbuilding figures as John Elder and William Pearce. In 1937 the Robert Duncan East Shipyard which had closed in 1931 was reopened under Lithgows name. After a busy WW2, in 1949, Sir James Lithgow, one of the greatest British industrialists of the first half of the 20th Century but by then in failing health, set up Scottish Ore Carriers Ltd, a firm that was to be a significant customer of the Port Glasgow yards in the ensuing years. In 1961 Lithgows took control of Ferguson Brothers (Port Glasgow) Ltd and its Newark shipyard but Ferguson continued to trade as a separate entity	until the nationalisation of British shipbuilding in 1977. In 1963 the East Yard was merged with Wm Hamilton & Company's Glen Yard, acquiring a 225t Arrol 'Goliath' gantry crane. In 1963 the David Rowan engine-building subsidiary was merged with Fairfield's engine-building to form Fairfield Rowan Ltd but, in the following year, Rankin & Blackmore closed its century-old Eagle Foundry in Greenock and in 1965 the Fairfield Shipbuilding & Engineering Company was placed in receivership. Eventually the Govan shipbuilding operation continued outside Lithgows control as the new company, Fairfield (Glasgow) Ltd. However there was no lasting reprieve for engine-building subsidiary Fairfield Rowan which ceased operations in 1966. The Elliot Street engine works in Glasgow were taken over and operated by the Scottish Machine Tool Corporation until the 1980s. By the late 1980s all trace of it had disappeared under light industrial redevelopment operations. In 1966 Lithgows purchased the Inchgreen Drydock from Firth of Clyde Drydock Company. It occupied the site of Lithgows' former Inch yard. In 1968 Lithgows merged with the Scotts Shipbuilding & Engineering Company of Greenock, the oldest surviving shipbuilding firm in the world at that time, under a holding company named Scott Lithgow the Port Glasgow operation continued to trade separately as Lithgows (1969) Ltd. In 1970 Lithgows (1969) Ltd purchased the Campbeltown Shipyard Ltd. By 1972 the Glen, East and Kingston Yard had been amalgamated effectively into one modern shipbuilding facility. In 1977 Scott Lithgow Ltd (and its Scotts, Lithgow, Ferguson and Scotts of Bowling subsidiaries) were absorbed into the state owned British Shipbuilders Ltd. The Bowling shipyard was closed shortly thereafter as part of BS rationalisation. From 1981 the former Lithgow Kingston/Glen Yard was operated by Scott Lithgow (Offshore) Ltd.In 1983 the former Lithgow yards at Kingston / Glen were sold to Trafalgar House plc but were unused after 1987. The yards were partly dimantled in the period 1987-95 and in 1997 the 225t Arrol Gantry Crane succumbed, reluctantly,to the demolisher's explosives - the last symbol of the great Lithgow and Scott shipbuilding empires, responsible for building almost 2000 ships, finally disappeared from Inverclyde after almost 300 years. By 2008 substantial parts of the former Lithgow shipbuilding sites had been redeveloped for retail and residential purposes. After 1977 Lithgow business interests diversified into hotels and electronics, however, they retained some interest in shipbuilding with subsidiary Buckie Shipyard Ltd in north-east Scotland. 'Lithgows' built over 1000 ships in Port Glasgow - this album serves as a small reminder of some of those ships and, hopefully, the people that built them. Lithgows early motorships were supplied with engines built by the Clyde's largest independent marine engine builder - John G Kincaid & Company of Greenock. 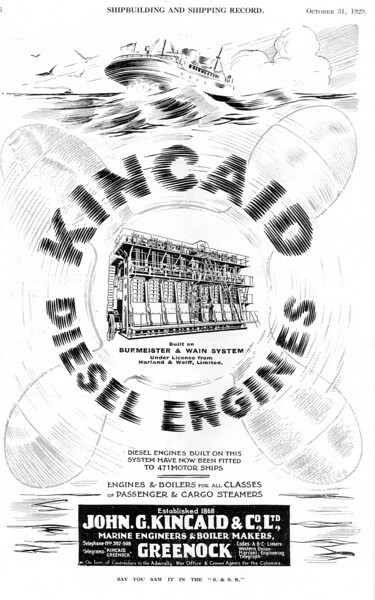 This advert shows a Kincaid-built engine of the type that would have been fitted to British Valour and her contemporaries. Kincaid's built diesel engines to the design of the Danish company Burmeister & Wain under a sub-license from the shipbuilders Harland & Wolff, which became B&W's sole licensee in the UK following its takeover of the short-lived Glasgow-based Burmeister & Wain Oil Engine Company. (Subsequently, Lithgow subsidiary David Rowan obtained a license from the Swiss firm Sulzer Brothers of Winterthur to built that company's diesel engines at their works in Glasgow). Incidently, H&W also built the B&W diesel at their Scotstoun Engine Works (formerly the Coventry Ordnance Works) with castings from the Clyde Foundry in Govan. For their first 56 years Kincaid's concentrated on the reciprocating steam engine and the boilers required to supply them with steam. In 1924 they built their first of many slow speed B&W-H&W diesel engines. Kincaid's works occupied a prominent site adjacent to Greenock's James Watt Dock where the harbour authority installed a 150-ton Giant Cantilever Crane (built at the Parkhead Crane Works by Sir William Arrol & Company of Dalmarnock, Glasgow). Kincaid's made good use of this close facility for the fitting of engines in new vessels. It was also used by the adjacent enginebuilding works of Scotts Shipbuilding & Engineering Company. Kincaid's made one foray into the world of shipbuilding when they entered into partnership with the Coast Lines shipping company in the part ownership of Ardrossan Dockyard Ltd.